The Bellevue Manila is weaving loving memories for you and your loved ones with romantic urban cityscape, hearty feasts and rekindling love songs. From February 9-15, let the cupids capture your love in a dreamy city escapade with the Romantic Nights room package. For Php 9,500 net in a Main Wing Deluxe Room or for Php 10,500 net in a Tower Wing Deluxe Room, have a memorable stay that includes an overnight accommodation and buffet breakfast for two (2), and two (2) tickets to the Valentine dinner at Vue Bar on February 14. For those who wants longer spiced up staycations, Suite Promises room packages at Php 7,500 net in a Main Wing Junior Suite and Php 8,500 net in a Tower Wing Suite inclusive of an overnight accommodation and buffet breakfast for two (2) is made just for lovers like you from February 1 to 29. An access to the Signature Lounge where you can have an option to have your breakfast is also included plus a 20% discount to the Valentine dinner at Vue Bar on February 14. Over at Vue Bar enjoy a sumptuous spread of international cuisines on a Valentine Dinner on February 14. 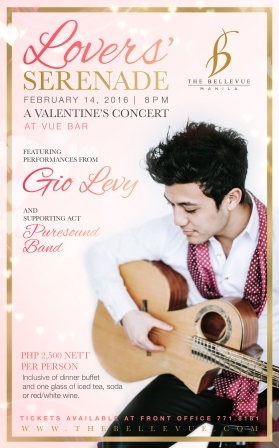 Feel the gush and blush as Pure Sound and Gio Levy serenade you at Php 2,500 net per person, for a buffet dinner, a glass of wine, soda or iced tea. Love is definitely in the air at The Bellevue Manila. Whether you’re happily committed or single by choice, celebrate Valentine’s Day the way it should be – sweet, exciting and fun! Promotions may not be combined with any other discount or offers. Prior reservation is encouraged. Other terms and conditions apply. For inquiries and reservations, please call (02) 771 8181.